Lamb, the meat from the carcass of a young sheep, is a lean red meat with a mild, but distinctive flavor. 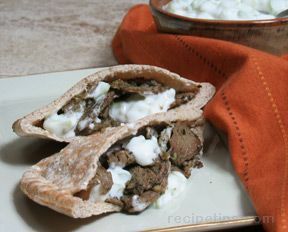 A very nutritious food, lamb is a good source of protein, B vitamins and iron. Although it is eaten less often than beef in the U.S., lamb is the meat of choice in many parts of the world, both for everyday meals and holiday feasts. Milk-fed lamb not more than 10 weeks old, less than 20 pounds, very pale pink in color. Usually roasted whole. Spring or Easter Lamb Several months old, usually 20 to 40 pounds. Often spit-roasted. Lamb Five months to one year old. This is the age at which most lamb is marketed. 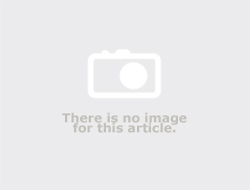 A wide variety of cooking methods are suitable. (sometimes called Hogget) Meat from animals 1 to 2 years old. The meat is darker and more flavorful than lamb. Although not widely available, both yearling and mutton are excellent choices for flavorful ethnic dishes. Mutton Meat from any sheep more than 2 years old. (Sometimes yearling is considered mutton.) Cuts are larger, the color darker red, the flavor more pronounced. There are five primal, or basic, cuts of lamb: Shoulder, Breast/Foreshank, Rib, Loin/Flank, and Leg. Each of the primal cuts can be further divided into a variety of subprimal and market ready, or ready to cook, cuts. Described in the tables below are the lamb primal cuts and the subprimal and market ready cuts obtained from them. The shoulder is the primal cut that includes the upper front leg, the shoulder blade, ribs 1 through 5, and the neck. Because these muscles get a lot of exercise, the meat is tougher and more flavorful than the loin or hind leg. It also has more connective tissue, veins of fat, and many bones. Shoulder cuts are usually cooked using moist heat, although meat from young animals can be successfully roasted at low temperatures. One of the larger cuts of lamb, whole shoulder is very flavorful. 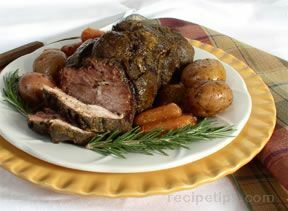 Bone-in shoulder roast can be used in a variety of recipes and is a more economical cut than leg roast. 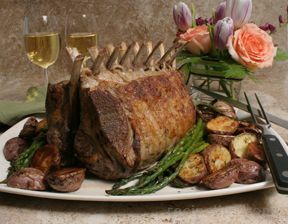 Although many cooks believe that a bone-in roast produces better flavor, the complex bone structure of the shoulder makes it difficult to carve. The bone-in shoulder is also known as the square-cut shoulder. Boned whole shoulder is usually rolled and tied to maintain its shape, if it is to be roasted. This is an ideal cut for stuffing. The shoulder can also be divided into three subprimals: neck, blade, and arm. The neck is a small, tough, flavorful cut usually sold whole or cut into crosswise slices, and is cooked using moist heat. 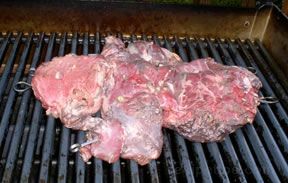 Neck meat may also be used as stew meat or it may be ground. The blade roast is cut from the shoulder blade section of the shoulder primal. Saratoga Roll This refers to a boneless center roast obtained from the blade portion of the shoulder and is also known as a chuck eye roast. Blade Chop The most flavorful and economical chops come from the shoulder. They can vary a lot in degree of tenderness. In general, the blade chop, from the back side of the shoulder will be more tender than the arm chop from the front side. The arm roast is cut from the upper arm section of the shoulder primal. Arm Chop The arm chop is cut from the upper arm section and contains a cross-section of the upper arm bone. It is a bit less tender than the blade chop. 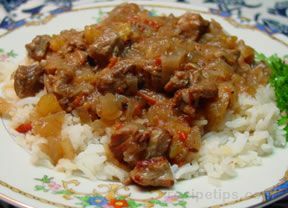 Other Stew Meat Shoulder meat, trimmed of fat and connective tissue, is the best choice for stew. It is usually sold already cut into cubes, but a shoulder roast, boned or bone-in, can easily be chunked into stew pieces. 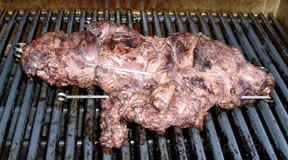 Kebab Meat Cubed shoulder meat is sometimes used for kebabs to be grilled, but since the shoulder is not as reliably tender as the leg, kebabs prepared with leg meat are a better choice for grilling. The breast is the lower part of the front half of the lamb's carcass. It tends to be quite fat, but very flavorful. The foreshank is the front leg from the knee to the shoulder primal. The whole bone-in breast can be used as a roast when cooked with moist heat. It is often boned and rolled in which case it is usually stuffed and braised. Spareribs, which contain more bone and fat than meat, may be in large slabs or separated into riblets. Spareribs that have been trimmed of all fat and connective tissue are known as Denver ribs. The foreshank is the leanest cut of lamb and requires long slow cooking with moist heat to dissolve the connective tissue. It may be whole or cut across the bone into rounds. The foreshank is also known as simply a "lamb shank", but this can be confusing because the lower part of the shank half of the rear leg is also known as a lamb shank. A lamb shank is also known as a trotter. Other Ground Lamb Scraps from the breast and foreshank are often ground into lambburger. The rib is the section of the lamb carcass on either side of the backbone between the shoulder and the loin and includes ribs 6 through 12. Rib meat is expensive, mild flavored, and tender. 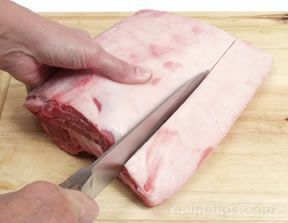 The rib cut has an outer layer of fat which can be trimmed off but, if left on during cooking, melts and bastes the meat. Rib meat is best cooked using dry heat: by roasting, broiling, or grilling. 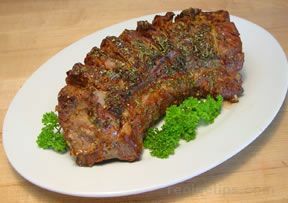 A whole rib roast, or "rack of lamb" has seven or eight ribs. Although it may be cooked as any roast, there are several traditional and very elegant treatments. When "Frenched," or prepared with the upper ends of the rib bones trimmed (and often capped with decorative covers) it is one of the most elegant cuts from the lamb carcass. Two or three racks can be combined end to end and then curved into a circle to make a Crown Roast, or a pair of racks can be roasted with their rib ends interlaced. Be sure the chine bone has been cut through. 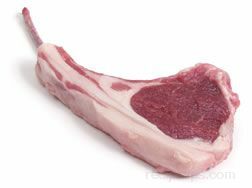 Rib Chop A rib chop is, with the loin chop, the most highly prized, the most tender, and tastiest cut of lamb. 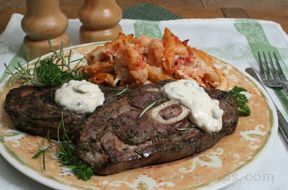 The rib chop has somewhat more fat than the loin chop and is therefore somewhat more flavorful. The loin primal cut is the section along the lamb's back from the 13th rib to the hip. It also includes the flank, or belly section, which is much tougher than the loin section. The loin contains the most expensive, highly prized, and tender meat. It is somewhat leaner than the rib cut. Care must be taken in preparing loin meat, whatever the cut, so that it doesn't dry out during cooking. Therefore, it is recommended that cuts from this area be served medium rare or medium, and never well done. Loin Loin Roast The entire section may be left whole as a bone-in roast. It is not a large cut and should be cooked carefully to prevent overcooking and drying out. Loin Eye Roast This is a boneless cut which consists of the muscle that lies along the backbone. It makes an elegant, expensive roast but is quite small, usually weighing not more than two pounds. Saddle of Lamb This cut is a double loin roast, from both sides of the backbone. 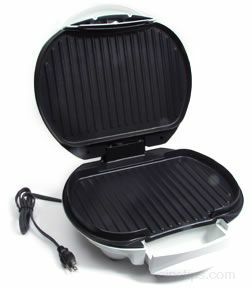 It does not contain a large quantity of meat, but the quality is unsurpassed, and it is easy to carve. The cut would probably need to be special-ordered from your butcher. The loin roast can be sliced crosswise into individual chops. 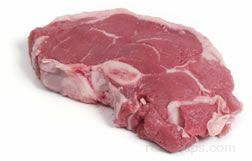 Loin chops are the most tender, leanest, and most expensive of the various lamb chops and can be identified by the "T-bone". The loin chop is sometimes called the lamb T-bone chop. If cut from both sides of the backbone, they are called double chops. Medallion or Noisette These are crosswise slices of the boneless loin and are suitable for very quick cooking. They are often served with a sauce. Tenderloin Tenderloin This cut consists of the other muscle in the loin and is very tender and small - too small to roast, it should be grilled or sautéed. Flank Flank/Apron Unlike other cuts from the loin, the flank is tough and is usually ground into lambburger. Although a lamb has four legs, only the two hind legs produce the cut referred to as "leg of lamb". It is a large, lean, and tender cut and can be used whole or subdivided into smaller cuts, which can be prepared in many different ways and are usually cooked using dry heat. The whole, bone-in leg can weigh from five to nine pounds and may be American style (no shank bone attached) or French style (shank bone left on). A whole leg that has been boned makes a compact and tidy roast when rolled (with or without stuffing) and tied or netted to keep its shape. It may also be butterflied (so-called because the deboned, flattened leg resembles a butterfly's shape) for grilling. Sirloin Half Sirloin, Half-leg Roast, Bone-in The sirloin (top of the leg, hip area) is meatier and more tender than the shank half and makes an excellent oven roast and usually weighs 3 to 4 pounds. Sirloin, Half-leg Roast, Boneless The sirloin half, when boned and rolled, makes an ideal size (about two pounds) for four people. Leg (Sirloin) Chop Leg chops come from the sirloin end of the leg. They are identifiable by the crosscut section of round leg bone within the meat. 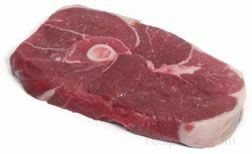 Sirloin chops are very meaty and make a larger and more economical chop than either rib or loin chops. The shank half of the leg is leaner than the sirloin half, but it is tougher and chewier and has a higher percentage of bone. It makes a flavorful small roast if cooked properly. It typically weighs 3 to 4 pounds. The shank half of the rear leg is often confused with "lamb shank", which most often refers to the foreshank, but may also refer to the lower end of the shank half of the rear leg. Lamb Shank A lamb shank is the lower end of the shank half of the rear leg. The foreshanks are also known as lamb shanks. Crosscuts Center Leg Roast Cut from the center of the rear leg, the center leg roast contains a portion of the sirloin half and a portion of the shank half of the leg. Leg Steak Steaks are cut from the center of the leg. They are identifiable by the crosscut section of round leg bone within the meat. 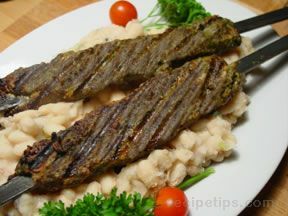 Other Kebab Meat Kebabs are cubes of meat, ideally free of fat, bone or connective tissue, usually meant to be grilled, as in shish kebab, souvlaki, or shaslik. Leg is the preferred cut for kebabs since it has large muscle areas which yield cubes free from gristle and bone, and is tender enough for grilling. Leg cubes are sometimes used for stew meat although this lean, tender cut is less suitable for stew than the more flavorful shoulder. Liver Although it has the characteristic liver taste, lamb liver is milder and sweeter than beef or pork liver and is very tender. It is an excellent source of iron and B vitamins but is also quite high in cholesterol. Kidney Lamb kidneys are valued for their tenderness and mild flavor. They are often grilled or roasted, but should never be overcooked. Cooked until tender and covered with a seasoned broth, these organ meats make excellent cold cuts. Saddle of Lamb This cut is a double loin roast, from both sides of the backbone. Foresaddle of Lamb The entire front half of the lamb carcass, from a lamb of about 20 pounds. It is usually stuffed and roasted. Baron of Lamb The entire rear half of the lamb carcass, usually from a lamb of about 20 pounds. It is usually roasted. These are both special preparations of Rack of Lamb and may be available from some butchers without special ordering; or they can be created by the home cook from two racks.